The old saying goes “everything old is new again.” Except when it comes to the summer movie crop of 2014, in which all the retreads, reboots, and remakes seem like those that came before. 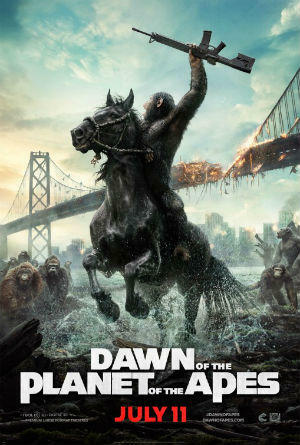 And Dawn of the Planet of the Apes is no exception. This particular cycle of cinema began in 1968 with the original film Planet of the Apes, which spawned four sequels, two TV series, a 2001 remake from director Tim Burton which was less than well-received, then 2011’s Rise of the Planet of the Apes, which I recall was actually pretty good. Now comes the 2014 Dawn of the Planet of the Apes, which is pretty much a casserole of plot points, social commentary, and high-tech action scenes in yet another effort to mine bags of box office coin from a proven commodity. Dawn of the Planet of the Apes is directed by Matt Reeves, who was responsible for Cloverfield, a sci-fi monster movie that has a large following of appreciative fans. I tried three times to watch Cloverfield but never made it past the first thirty minutes. And like Cloverfield, Apes the style of that earlier film. The most recognizable names and faces in the new Apes saga are Gary Oldman and Keri Russell. 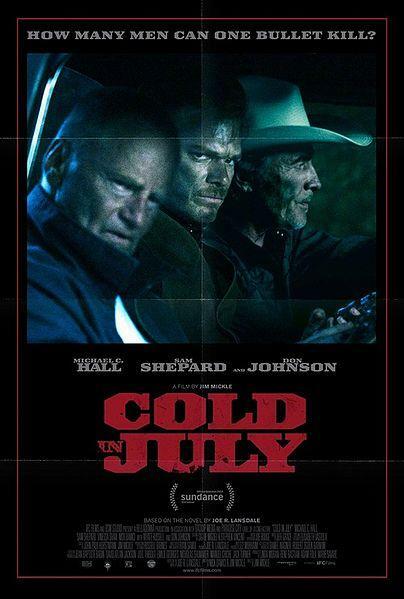 The rest of the performers are ok in their roles, but are not likely to enhance their salary scales based on this film. 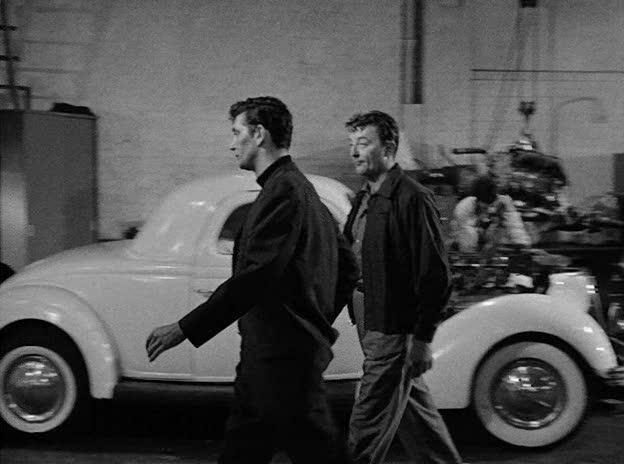 The style is a current favorite in filmmaking that I like to call “dark grunge.” This means that a lot of scenes are at night, during rainfall, or other obscured visions. Civilization has been decimated and everything is in ruins. Like this summer’s earlier reboot, Godzilla, the city at the heart of this film is San Francisco. The PG-13 rated Dawn of the Planet of the Apes is now playing just about everywhere. If you’re tired of the sci-fi genre being hijacked just so Tom Cruise can make another movie, or director Michael Bay can churn out another overlong, turgid Transformers epic, then there’s a new film you should flock to immediately. 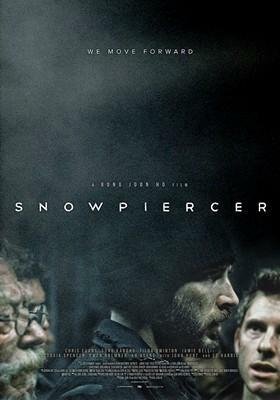 It’s called Snowpiercer and it’s not playing everywhere, so you’ll have to seek it out. Once again it’s summertime, and the living is… well, in many instances… mobile. What with enjoying the seasonal events and travels, and the upcoming weekend of big racing at the Kentucky Speedway, I started thinking about the symmetry between two of Americas great loves: cars and movies. With all the various platforms available for movie delivery these days, there are some films that totally slip by unnoticed, since they don’t get a regular theatrical release. Such is the case with The Angriest Man in Brooklyn. It had a one-week run in New York and Los Angeles, and then went to the video-on-demand section of your cable or satellite provider. 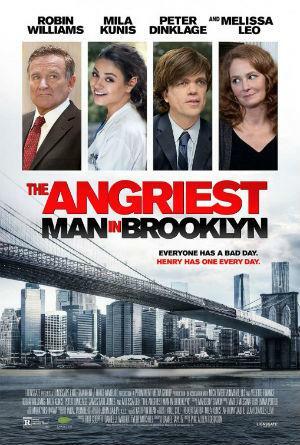 Despite the title, and presence of star Robin Williams, it’s not a comedy. Williams plays an attorney in Brooklyn whose hard knocks have completely soured him on life, and he’s determined to take it out on anyone who’s handy, which he does with great regularity. A minor incident causes him to go to his doctor, who is out of town. The attending physician tells Williams that a previous scan revealed a brain aneurism and that he is likely to die within the next ninety minutes. So what would you do in such circumstances? Live it to the fullest? Try to reconnect with those from whom you are estranged? Or be even angrier? In the never-ending search for critical adoration and separating moviegoers from their hard-earned dollars, filmmakers seem to embrace the theory that “more IS more.” They try to cram 10 pounds of “stuff” into every two-pound bag to appeal to as wide an audience as possible. That’s to be expected with the blockbuster films, but it sometimes works its way into the smaller, low-key titles as well.